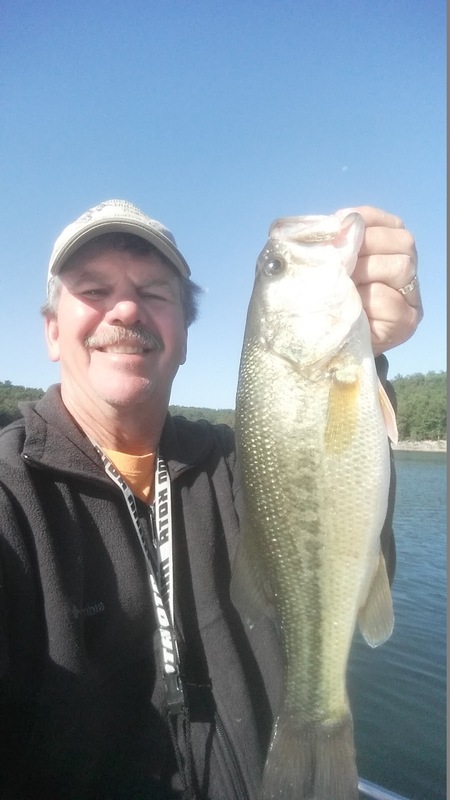 Norfork Lake fishing is transitioning from the summer fishing pattern to the fall fishing pattern. The crappie bite has been outstanding, bass bite is good, catfishing has been good, walleye bite is fair and the striper bite for most anglers has been slow. 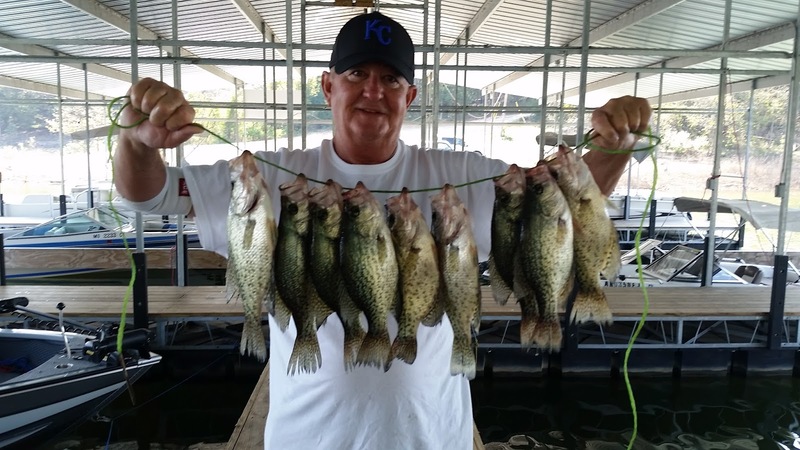 My guests and I have been finding crappie on main lake brush piles. The most productive brush piles should be in 35 feet or less of water and the crappie will be inside of the brush and up to the top of the brush pile. 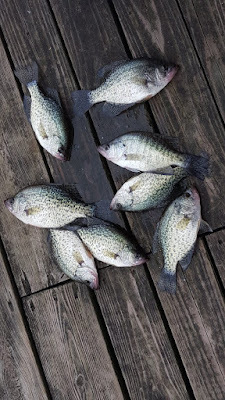 As the water warms during the day the crappie are moving up higher in the water column and have been caught as shallow as 8 feet down, but still suspended over the brush or very close to the brush. 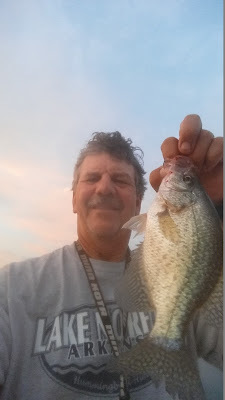 Small live crappie minnows called tuffies are a great bait for catching crappie. Rig up a light action rod with 4 pound test line (clear or green) add a slip float and a small split shot. Set the slip shot about 2 feet above the bait hook. I typically use a #6 to a #10 hook with a little longer shank. If you can net your own bait small thread fin shad will also be outstanding. For artificial baits, I have been having good success with a 1/4 ounce spoon vertical jigging it at the depth where I see the fish or at the top of the brush. Small grubs with a twister tail or a paddle tail are also a great bait to use. I typically use my artificial baits without a float, but for some, adding a slip float may make it easier to find your depth and keep it consistent once you find the depth where the fish are feeding. When using a grub you can always add a small crappie minnow to the hook, which may get you more strikes. Largemouth, smallmouth and spotted bass fishing has been good and appears to be getting better every day. I am finding this specie in many different types of areas. Last evening I was crappie fishing over a brush pile close to a bluff line. As the sun was setting the bass starting feeding on the surface. Top water action lasted for about 20 minutes until the sun set below the tree line. 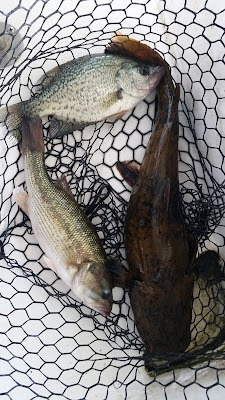 Many of the fish coming up were small, but I did get to land a couple of 2.5 pound spotted bass. This morning as I was checking out some new brush on a bluff line point, I noticed many fish suspended 8 - 15 feet down. I tied on a wiggle wart and started to catch largemouth bass, but most were on the short side. Most of my bigger fish have come out of 28 - 30 feet of water on the bottom. 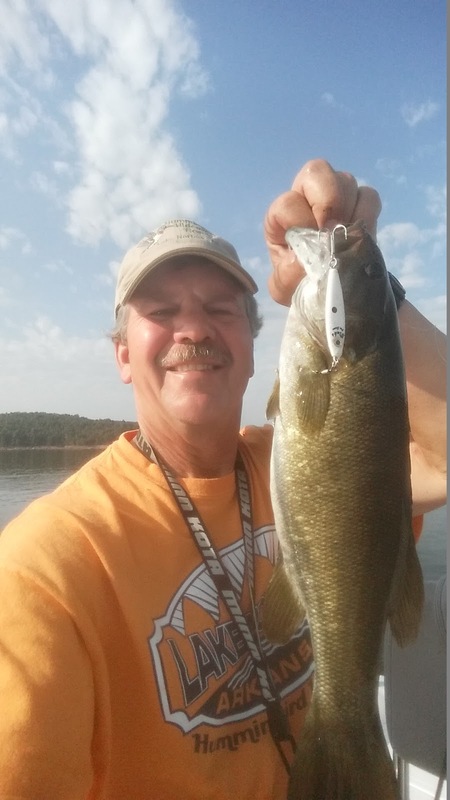 I have been vertical jigging a 3/4 ounce spoon on the bottom either along a bluff line or a big rounded main lake point looking for walleye, and have run into small schools of large and smallmouth bass. Once I find these fish I can usually land 2 before the school moves on and I continue jigging. In general, very early and very late in the day, the bigger fish are moving up to the surface and some up along the shore line. Mid day they move down into 30 feet of water. Walleye fishing has been fair. 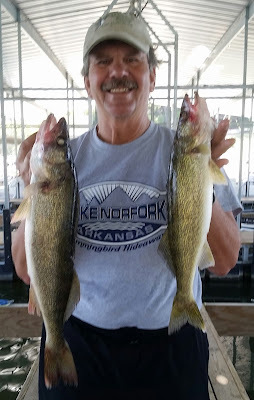 I have not been able to identify a good pattern except that all my walleye have come out of 28 feet of water either close to brush or close to a main lake bluff line point. I have only used a spoon and have been vertical jigging. A bottom bouncer weight with a crawler harness or a drop shot rig with a worm or minnow will also work. Deep diving crank baits that will get you down to the 30 feet level should also pick up a few nice fish. 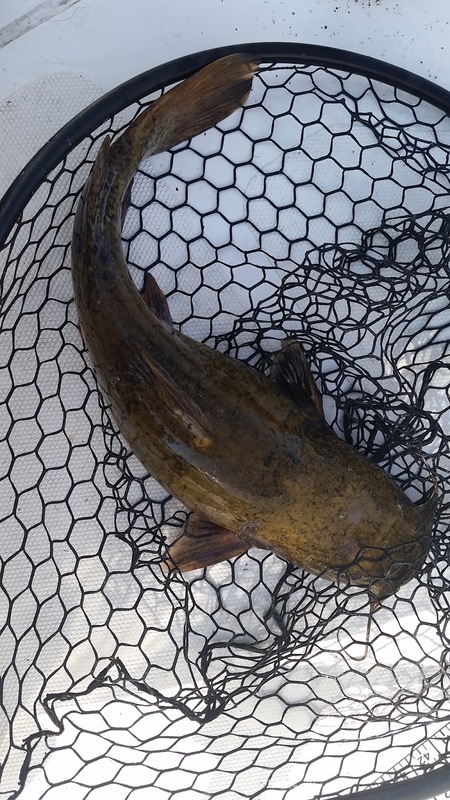 Catfish are hanging around the brush piles in 28 - 35 feet of water. I have landed nice sized flatheads and channel cats vertical jigging a 3/4 ounce spoon. Crawler harnesses or drop shot rigs will also pick up some nice fish. Striped bass fishing has been slow, at least for me. 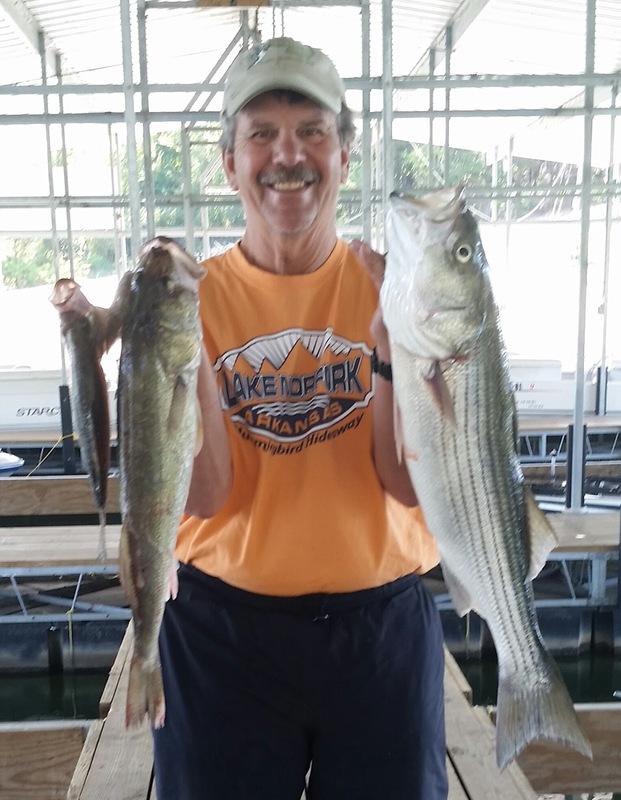 I have been able to land a few, but I have only actually targeted stripers a few times over the last couple of weeks. 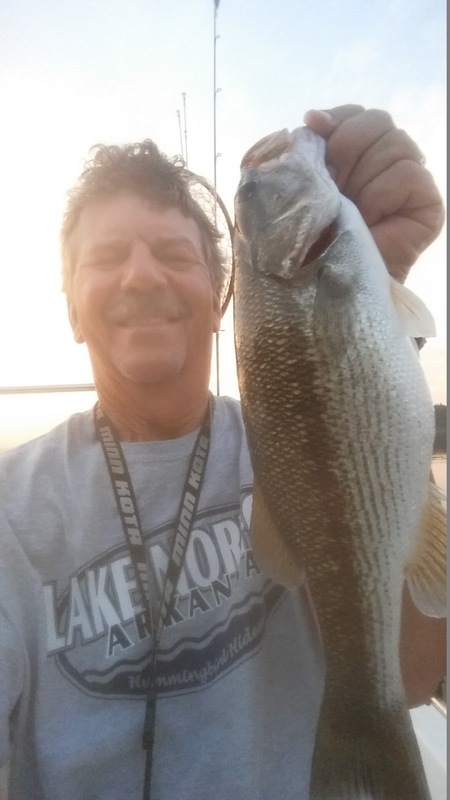 I found stripers on a large flat in the midlake area and landed several fish using live thread fin shad. I found stripers before sunrise in 20 - 30 feet of water on the bottom feeding. In addition, I have found small schools of stripers about 10 feet down in 20 - 40 feet of water. I have been setting 2 down poles with live bait at 20 - 25 feet and 2 free lines with only a very small split shot. 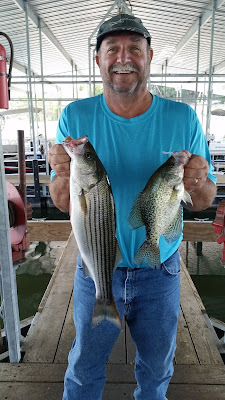 I have landed stripers on both down and free swimmers. Once the sun comes up they disappear. I have also picked up several nice sized stripers while jigging my 3/4 ounce spoon. These stripers were close to brush piles or along bluff lines. This tells me we have a lot of scattered fish which will school up again once the water cools. A third area which I have not tried yet, but typically is productive this time of year, is up river in the Missouri waters. Look from Calamity area up to point 10 and beyond. I wouldn't be surprised if the stripers have even migrated farther up river since the dam in the Dawt Mill area has been removed. Norfork Lake level is falling about 3 inches per day with the equivalent of one generator being run and currently is 557.72. This level is only 2 feet above normal seasonal pool. The lake surface temperature is ranging from 77 degrees in the morning to the very low 80's in the afternoon. The mid to upper portion of the main lake is clear to some what stained with the coves and creeks stained.